A deeper relationship with God is the key to both spiritual and physical health. God not only saves souls, He helps people lose weight, stop smoking, eat a more sensible diet and exercise regularly. God is the most potent force for lasting behavior change. The Handbook for Health Evangelism will shake up church members. Inactive members will go to work helping community members live healthier lives. The church will be transformed from a building that is empty six days a week to a center of neighborhood activity. The Handbook for Health Evangelism trains members to provide friendship and support to those who are struggling to change bad health habits. Pastors and laypersons can both use Handbook for Health Evangelism to save people spiritually and physically. These concepts and methods have been tested in churches from Maryland to California. Elvin Adams, MD, MPH is a nationally recognized health expert. He is also a church elder and organizer. 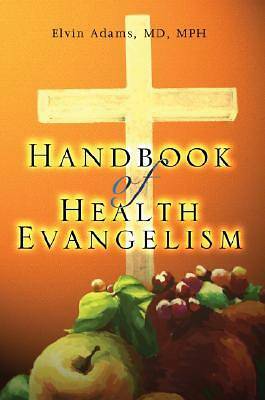 His 30 years of first hand experience is organized into this practical Handbook for Health Evangelism.